Marbles are small balls of colored or decorated glass which are either intended for playing the ancient game of marbles or as collector's items. They can be mass produced or hand-made. One ancient method of making colored marbles was to put a mixture of sand and charcoal into an iron mould shaped like a marble and place small pieces from glass canes into this mixture, then heat and rotate the mould to melt and fuse all the edges. The marble was polished when it was cold. 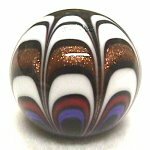 Today there are glass artists who specialise in making marbles, and their creations can be really spectacular, like the limited edition "Zebra Swallowtail" marble by Drew Fritts shown at the top of this page. Most hand-made marbles today are cut from a glass cane containing the design, and then heated and rounded. Alternatively, they may be created individually on the end of a punty rod, like making a paperweight. Here are some books on marbles for collectors. Just click on the book covers or titles for more information. Master Glass Company Marbles: A Price, Identification and Information Guide (Oct 2016) by George Sourlis. This company's marbles were sold in bags and boxes of other major marble companies. How to identify them. Sell Antique Collectable Marbles on eBay (May 2016) Kindle Edition by Avril Harper. Marbles Identification (April 2012) by Robert Block. Revised 2nd Edition. A very popular best-selling book on marbles. Marble Mania (Feb 2011) by Stanley Block. Revised 2nd Edition, useful book for collectors. Marble Collectors Handbook (July 2007) by Robert S. Block. Very useful for identifying marble types. Popular American Marbles (July 2007) by Dean Six, Susan Metzler and Michael Johnson. Machine-made marbles made by several US companies. Collecting Antique Marbles: Identification and Price Guide (Nov 2004) by Paul Baumann. Collecting Early Machine-Made Marbles: The M. F. Christensen & Son Company and Christensen Agate Company (Nov 2003) by Robert Block. Marbles: Identification and Price Guide (Nov 2002) by Robert Block. Everett Grist's Big Book of Marbles: A Comprehensive Identification & Value Guide for Both Antique and Machine-Made Marbles (2nd Ed) (April 2000) by Everett Grist. Marble Collectors Society of America Price Guide (1985) by the Marble Collectors Society of America. Price Guide to Collecting Antique Marbles (June 76) by P. Baumann.